These images show the location of an event, discovered by NASA’s Chandra X-ray Observatory, that likely signals the merger of two neutron stars. A bright burst of X-rays in this source, dubbed XT2, could give astronomers fresh insight into how neutron stars — dense stellar objects packed mainly with neutrons — are built. On March 22, 2015, astronomers saw XT2 suddenly appear in the Chandra data and then fade away after about seven hours. By combing through the Chandra archive, they were able to piece together the history of the source’s behavior. 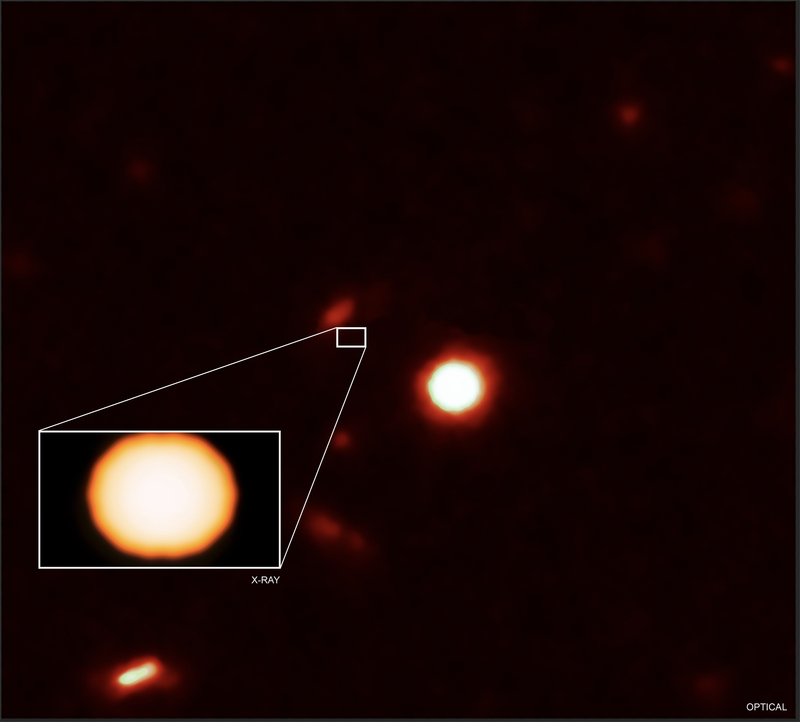 The researchers compared the data from XT2 to theoretical predictions made in 2013 of what the X-ray signature from two colliding neutron stars without a corresponding gamma ray bursts would look like. X-rays from XT2 showed a characteristic signature that matched those predicted for a newly-formed magnetar, that is, a neutron star spinning around hundreds of times per second and possessing a tremendously strong magnetic field about a quadrillion times that of Earth’s. XT2’s bright flare of X-rays gives astronomers another signal — in addition to the detection of gravitational waves — to probe neutron star mergers. A paper describing these results appeared in the April 11th issue of Nature, led by Yongquan Xue (University of Science and Technology in China). NASA’s Marshall Space Flight Center in Huntsville, Alabama, manages the Chandra program for NASA’s Science Mission Directorate in Washington. The Smithsonian Astrophysical Observatory in Cambridge, Massachusetts, controls Chandra’s science and flight operations. Credit: NASA/CXC/Uni. of Science and Technology of China/Y. Xue et al. Scale: Chandra images are about 15 arcsec (360,000 light years) across.